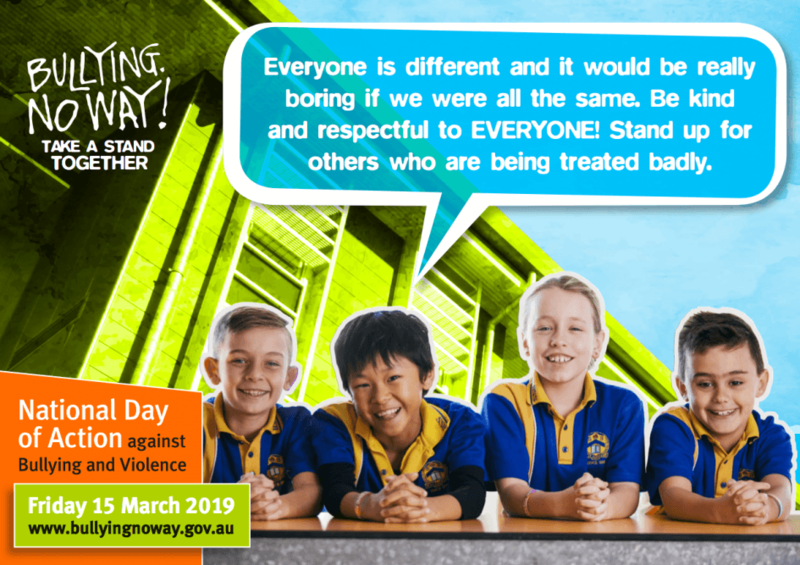 Unley Primary School is empowering students to take a stand against bullying and violence through this year’s National Day of Action against Bullying and Violence (NDA) next Friday, 15 March. The theme for this year’s NDA is: Bullying. No Way! Take action every day. Parents and families are an important part of our work to prevent bullying and to respond effectively if it happens. Stopping bullying involves everyone. Next week, families will receive a pocket card from Bullying. No Way! with tips on what to do if your child talks to you about bullying. Students will also receive a pocket card with helpful tips, as well as a colourful wristband to help promote the Take action every day message. Unley Primary School is committed to providing a safe, respectful and inclusive learning community where everyone can thrive. Please help us to achieve this goal by having a conversation with your child about the ways they can be a supportive and kind young person who takes action to help others. View the Unley Primary School Anti-Bullying Policy.